An opposition heavyweight in Kyrgyzstan is set to return home after an 18-month stretch of self-imposed exile, setting the stage for a nerve-jangling season of politics. Omurbek Babanov, a wealthy businessman who has been based in Russia since losing the October 2017 election to incumbent President Sooronbai Jeenbekov, is expected to fly in to Bishkek early in the afternoon on April 13. What will happen when he arrives is a conundrum. One possibility is that he could be detained as soon as he leaves the plane. Babanov faces possibly two outstanding criminal charges — one for allegedly inciting ethnic tensions during his election campaign, the other is related to an alleged plot to seize power by fomenting unrest after failing to win the presidential contest. Babanov has insistently derided both accusations, which most independent-minded observers agree were concocted on political grounds. The security services have at some point indicated that this second charge has been dropped, although the precise situation is opaque. In any event, Babanov’s political party, Respublika, has given notice that it intends to hold a rally on April 13 in the capital, Bishkek. Organizers have reportedly estimated that 10,000 people could attend the event. Political commentator and activist Edil Baisalov wrote on Twitter that he was informed by sources at NTS, a TV channel with links to Babanov, that rallies are also planned for other towns, namely Naryn, Karakol and Talas. Babanov has prefaced his return with two interviews, one to NTS and another to Russian daily newspaper Kommersant. In the latter, Babanov made noises that should prove soothing to Jeenbekov team, about how he is not wholly decided whether he wishes to resume his political career. “I have said that there are many beautiful things in life other than politics. For me, talk about helping the country is not just empty words. I am a wealthy person who made his money before getting into politics. The reason I took up politics was to change the country. Now there is a choice: I will either just engage in business and attract investments or perhaps we will create a foundation,” he told Kommersant. He then went on to suggest, however, that his significant political capital is something that he still retains as a safety backup option. 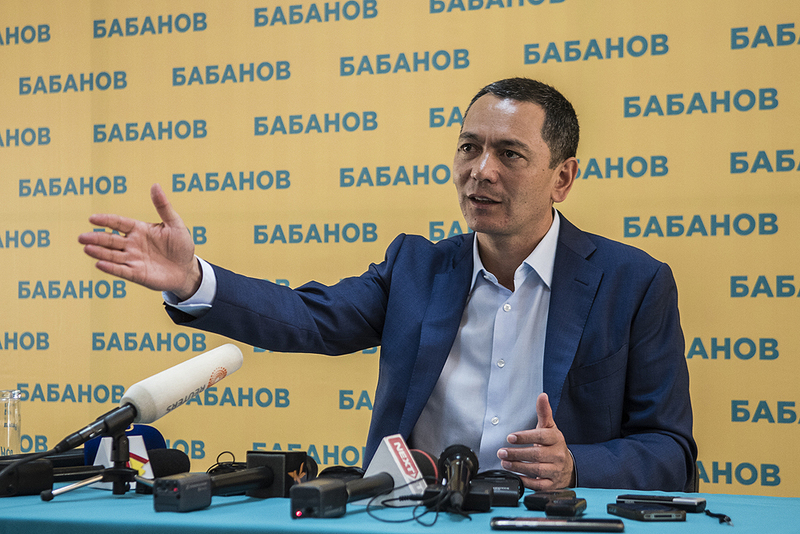 Babanov pointed to his Respublika party, which has a sizable chunk of seats in parliament and which he said will again compete in the next parliamentary elections, currently scheduled for 2020. If they “begin to hound me, by trying to scare me through criminal cases for example, I want to say that I am not a coward. In that case, they will push me back into politics,” he said. The interview with NTS was much more detailed and dwelled on the mechanics of his period in exile and speculation about what might happen once he is back in Kyrgyzstan. Babanov ominously hinted that he has numerous fervent supporters in his native Talas region — an assertion that carries more than a soupçon of threat to Jeenbekov. It is unclear how Jeenbekov feels about all of this. On April 11, he addressed parliament in a puzzling impromptu speech that consisted almost entirely of vague generalities about the future of the country. At some points, however, he directed some vague barbs at his political opponents, while never mentioning them by name. One was clearly his former mentor and ex-president Almazbek Atambayev, with whom he has engaged in a tiring battle of wits since early last year. But there also seemed to be allusions to the kind of things that Babanov has planned for his return. “Those people who dare to think that by bringing people onto squares and putting pressure on the authorities can settle any issues are sorely mistaken,” Jeenbekov said, without naming names. It is still something of a mystery whether Babanov and Jeenbekov even have beef as such. For sure, defeat in the October 2017 election still rankles with Babanov, but the menacing moves against him were originally initiated under the rule of Atamabayev, who only left office at the end of his single six-year term because he was required to do so under the constitution. The security services continued to issue warning messages to Babanov even once Jeenbekov was ensconced in power, but this may have been as much as an indication of the incumbent’s sense of insecurity than a signal of intent. By the logic of Kyrgyz politics, Jeenbekov is in an invidious position. Refraining from moving against Babanov will leave him in a state of perennial nerves about the nearby presence of a well-resourced and charismatic potential foe. A rash arrest, however, is bound to spark deep tensions and possibly unrest. It is far from certain that Jeenbekov yet possesses the political capital — or even the skills — to survive a season of turbulence.